What did the word “hospitality” mean in the past? And what does it mean today? The analysis by historian Anna Foa starting from the Evian Conference of 1938, that had been summoned to discuss the issue of Jewish refugees from Nazi Germany, during which nonetheless no participating country decided to host them. We, therefore, propose the words of Professor Foa, who has already expanded on this subject for the launch of GariwoNetwork. The core of my remarks is the theme of hospitality, seen not only as a topical matter of concern but also and mostly as a past issue. If it is true, in fact, as historian say, that events are always unrepeatable, that even if they give you the impression of repeating themselves, they always do in different modalities and contexts. Nevertheless it is also true that sometimes we find ourselves in the face of historical events and contexts, that remind us very closely of our past, and lead us to wonder if history is not really repeating itself, instead. Push-backs at the borders, fences erected to contain immigration, alarms on the invasion of migrants are not new phenomena, but they have precedents and possible terms of comparison in the past. The perception of refugees that the Lega (Italian political party) spreads is similar to the one that was widespread in the United States about the Italian migrants who arrived there, partly from the very North East that today has functioned as a cradle of the Italian anti-migrant hate. It may suffice to take just one of the numerous comic strips against the Italian migrants of those years, drawn from The Mascot of New Orleans, 13 April 1889: “Paupers, Vagabonds, Murders and other of the European and Asiatic Scum Refused Admission elsewhere, are Readily Landed Here”. One the foreground there is an Italian man with a bloodstained knife, on which the word “vendetta” is carved. Essentially, Italians were little, dirty and evil. But I would like to refer to a moment that followed the great migrations from the Americas, in particular, an event that had a lot of similarities with what is happening today, involving not the perceptions of the media, but the policies of the states. This event is the International Conference of Evian of July 1938, summoned upon the impulse of American President Roosevelt to solve the issue of the Jewish refugees from Germany. 32 countries, including 9 European, 3 Commonwealth and 20 Latin American nations, took part in it.It was a greatly significant event both for those who were directly hit, in that case, the German and Austrian Jews, who found themselves prevented from escaping the Third Reich, and for the rest of the world, as it was doubtlessly a major step toward Hitler’s war against Europe. The conference was summoned in Evian after Switzerland’s refusal to host it – because of the fear to be forced out of their neutrality policy. Nazi Germany was merely an observer, and yet a particularly interested observer, a sort of an unwanted guest making everybody feel uncomfortable, as at the time the Nazis still focused on emigration as a means to get rid of the Jews, to the point of proposing incentives to the countries that were eager to accept them. There was also another observer, Zionist leader Chaim Weizmann. Italy did not participate in the Evian Conference, as its Minister of Foreign Affairs Mr Ciano said he “was not interested”. “America’s Ambassador”, he wrote in his Diary, “came to ask us to establish an International Committee with the purpose of favouring the emigration of political refugees from Germany and Austria. I replied to him that such a demand clashed, rather than with our directives in international affairs, properly with our political morals. Philips was surprised by my reply. He saw in the proposal a humanitarian feature. I saw only a political one”. For the participating countries, and in particular, those who were more exposed to immigration the issue was about deciding whether to change their acceptance policies to host the Jewish refugees fleeing Germany or Austria, that had been annexed to the Reich in the same year 1938 with the consequence of increasing by a further 200000 the number of Jews who were there in t he German Reich. 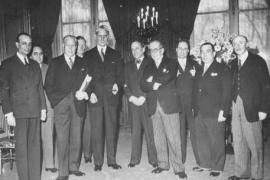 At the end of the Conference, though deploring the situation of the Jewish victims of the Nazi persecution, the participating states decided not to change at all their restrictive immigration policies and not to open up to Jewish immigration. The United States, a country where, between the Eighties of the Nineteenth Century and the first two decades of the Twentieth Century millions of Italian, Irishmen and Eastern European Jews had poured in quite freely, now introduced very restrictive immigration policies, based mostly on economic reasons, as early as in 1924. The crisis that followed the crack of Wall Street in 1929 had thus further increased this trend to shut the borders. In Evian, France said it had already reached the saturation point in immigration; Australia said that, as it did not have racism issues, did not want to import any; Canada resolutely refused to accept any; Mexico even restricted its planned immigrant quota; Switzerland and Sweden asked the German authorities to print a J (of “Jude”, German word for Jew) on the Jews’ passports, in such a way that they could be recognized during the immigration procedures. Only Denmark, the Netherlands and, in Americas, the Dominican Republic did accept part of the refugees. A mention apart would be deserved by the case of Palestine, under British mandate, where a huge part of the Jewish immigration could pour in. After a failed partition attempt in 1937, the stronger rapprochement of Palestinians and Arabs to Nazi Germany, combined with a resumption of the Arab revolt, pushed England, out of fear of an even closer alliance between the Arab world and Hitler, to produce the White Book of May 1939, limiting in the most drastic way Jewish immigration to Palestine. This was the death sentence for hundreds of European Jews. The Powers’ rejection put Hitler in front of the evidence that in Europe and the United States no one really cares about the Jews’ fate. In this sense, the conference was somehow a sighting shot of Nazism. The consequences were immediate. At the end of September, with the Munich Conference, the very European powers that had refused to accept the Jews underwent the Nazi annexation of Czechoslovakia without a reaction, in the name of “peace”. In November of the same year, there were great pogroms in Germany, Austria and Czechoslovakia, the so-called Crystal Night – the night of violence, murder, the massacre of Jews and deportation to the German lagers. From here started the path that would subsequently be followed by Germany: the path of war, albeit not yet necessary the path that would lead to the Holocaust. But the events of 1918 proved Hitler that he could do to the Jews what the Turks had done to Armenians and he could start a conquest war all over Europe. So the policy that was previously meant to force Jews to emigrate, turned, by 3 years only, into the policy aimed at wiping them out of the earth. Now we find ourselves – and here I resume Gabriele Nissim’s words - in a very dangerous moment: walls are erected and anti-semitism is growing, accompanied by racism (which is its breeding soil, whatever the Jewish world which I belong to, which still finds it difficult to come to terms with the fact that anti-semitism is also the product of racism, may think. Look for instance at what is happening in Hungary and Poland, where hostility is now targeted at migrants as well, and often comes with the growth of anti-semitism. The culture of hatred, and of contempt of the weaker, is spreading and strengthening more and more. Only two years ago there was a great emotion everywhere for the picture of the Syrian child drowned and stranded on the beach, but now I do not know whether there would be the same response. The pictures of the extermination of the Syrian people by Assad are quite a lot, and many of them are of children. The refusal to accept migrants is anticipating a future, in which all European values can be destroyed, the culture of hatred can grow, fascism can rear its ugly head again in the various European countries. It opens up political outcomes that we have already seen across history. This is why we must pay attention, although they will not resurface in the same way. To sum up, we talked about the culture of good, the teaching of good. I am always struck by the widespread mockery of “willingly co-operative people”. There is like a rejection of good and the idea of good itself, responsibility and justice. Such rejection crosses all political opinions: it does not only belong to the right wing, but also to many parts of the left, which do not see good as a motivation of human action to make the world a better place. Well, this has already occurred – and also here we get back in time – when in Italy the racist laws were promulgated in that horrible 1938: those who kept their friends with Jews, talked to them and did not join the hate campaign against them was then called as a “willingly religionist people”. Today it seems to me as though the word “willingly religionist person” (pietista in Italian) and the word “willingly co-operative person” (buonista) have the same value, and are similar to each other. Let’s please forget about this word, because it is heavy and dangerous. Let’s remember that good must be a value because otherwise, it happens what would have happened to Sodoma and Gomorrha according to the Bible. But where to find 10 Righteous?